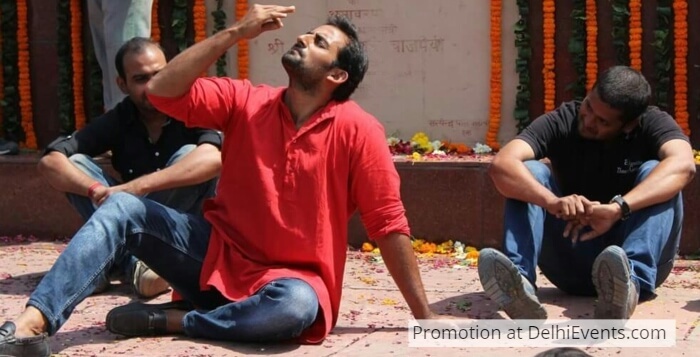 About the Play: Rajesh Kumar’s ‘Pagdi Sambhal Jattha’, is a play about Bhagat Singh and his companions’ sacrifice and struggle for India’s independence. The kind of dreams that he used to envision, his debates, thinking, ideologies are part of this play. This play is about Bhagat Singh and his compatriots’ work, ideologies and life. It depicts the lifestyle, social and political visions of these freedom fighters, who had sacrificed their life at such a young age. The revolutionary ideologies depicted in the play are much more relevant and contemporary in today’s world. These revolutionaries’ life, thoughts and ideologies inspire us and give us strength to fight for a better system and better society. It is very important for the modern generation to know about Bhagat Singh and his fellow compatriots’ ideologies. Written by Rajesh Kumar, ‘Pagdi Sambhal Jattha’ is also important for Asmita Theatre as it is the group’s 100th play. Asmita salutes our revolutionary martyrs pay homage through this play. About the Director: ​Arvind Gaur is known for innovative, socially and politically relevant plays in India. Arvind Gaur's plays are contemporary and thought-provoking, connecting intimate personal spheres of existence to larger social political issues. His work deals with Internet censorship, communalism, caste issues, feudalism, domestic violence, crimes of state, politics of power, violence, injustice, social discrimination, marginalisation, and racism. Arvind Gaur is the leader of Asmita, and is an actor - trainer, social activist, street theatre worker and story teller. Arvind Gaur was the recipient of a research fellowship awarded by the Ministry of Human Resource Development (India) (1997–98). He was on the guest faculty of Delhi University for Theatre in education program for three years. He organizes theatre workshops for children in schools and slums as well as street theatre performances on socio-political issues. He has directed more than 60 stage plays over two decades.